The Stratford Jr. Writing Pad comes with an external elastic loop and 3 internal elastic loops for holding USB memory flash drives and pens. 4 business card pockets. Clear ID window. Document pocket. Holds most Kindle and Nook products. 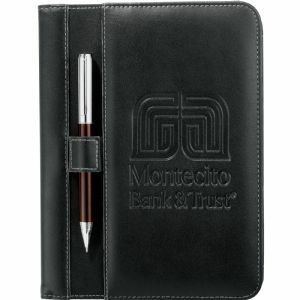 Includes 12.5cm x 20cm lined writing pad. USBs and Pen not included. Product Size : 215mm(h) x 158mm(w) x 19mm(l). Colour Print (Spine LeftCentered on Front Pocket): 12.7cm(h) x 7.6cm(l) – ONE COLOUR ONLY; Colour Print (Spine Left Lower Right Corner of Pocket 25mm up and in): 3.8cm(h) x 3.8cm(l) – ONE COLOUR ONLY; Colour Print (Spine TOP Centered 25mm down from top of pocket): 5.1cm(h) x 7.6cm(l) – ONE COLOUR ONLY; Colour Print (Spine Bottom Centered on Front Pocket): 7.6cm(h) x 12.7cm(l) – ONE COLOUR ONLY; Deboss (Spine Left Centered on Front Pocket): 12.7cm(h) x 7.6cm(l); Deboss (Spine LeftLower Right Corner of Pocket 25mm up and in): 3.8cm(h) x 3.8cm(l); Deboss (Spine TOP Centered 25mm down from top of pocket): 5.1cm(h) x 7.6cm(l); Deboss (Spine BottomCentered on Front Pocket): 7.6cm(h) x 12.7cm(l).